Fairytales seem to be stitched into Marchesa gowns. Tales of goddesses, flappers, princesses, brides, or the modern day woman, could be told through these gowns. My story at Marchesa New York Fashion Week Fall/Winter 2016, started on a dreary winter day set a blaze by photographers' cameras flashing as I walked towards Skylight at Moynihan Station - you know I dressed to impress while considering this very moment may occur (see below for What I Wore). Again, I was joining my BFF, Wendy, who put me on the list for behind-the-scenes access at this acclaimed show, so I opted for a blend of fashionable clothing and accessories, instead of going for comfort and work practicality (AKA: not bringing my Canon DSLR), which I sorely regret. Neither Wendy or I expected to go beyond backstage, which was thrilling enough, with the likes of famed make-up artist, Bobbi Brown, doing demonstrations on the models of the runway look from her cosmetic line, and the Marchesa designers, Georgina Chapman and Keren Craig, doing interviews before the show (pictured below). Ms. Brown, applying the very soft make-up look on one of the Marchesa models - so exciting! This model arrived to the show with a type of dreadlocked 'do, which the Moroccan Oil team was scrambling to remove, in able to create the soft hairstyle for this show. Moroccan Oil team was all go, making sure each models's tresses looked elegant, yet subtle, in line with the make-up for the show - with a middle parted, low wrapped chignon. Brown discusses the subdued look, a rose lip and minimal eye. With long red hair, this model's chignon was especially striking - but I am a fan of red hair. 'Where's Jeremy Scott?!' I thought frantically and scanned the crowd, as we walked past a SUV plastered with his name across it. Sadly, no sighting of JS, this time. Fashion Week is a frenzy! Everyone at Marchesa stayed hydrated thanks to Fiji Water - as these bottles were everywhere backstage thoughtfully, with perfectly-sized holes in each bottle cap, each paired with a perfectly-sized straw, for flawless lippies. We never thought we would get in - but we did! People herded their way in, so who would Wendy and I be to go against the herd (when that means you get to see a Marchesa show)? Ha. Anna Wintour was far across the room, but I could still see her - arms crossed, blond bob, sunglasses worn indoors - yep, that was her. And one seat over from Ms. Wintour - the gorgeous redhead (you may recall I am a fan of flamed haired women) model/singer/formerly-wife-of-Jack-White, Karen Elson. And, Zac Posen! ... Ok, ok. Star-gazing aside, you came to read about Marchesa for goodness sake! The sparkling accessories and embroidered shoes alone have me crushing, and we had not seen all of the gowns, yet! Minutes before showtime, a seamstress tirelessly works on finishing touches on one of the gowns - so stunning, I thought I was going to hyperventilate with glee. This baby blue gown was like a full-length babydoll, so floaty and stunning - one of my faves. The most beautiful gowns I have ever seen stomped by, all ruffles, beads and crystals. The wedge heels embroidered with a floral design were fantastic. Honestly, my best view of it all was backstage, as we only made it in by a hair - stood on the topmost bench, mid-room. 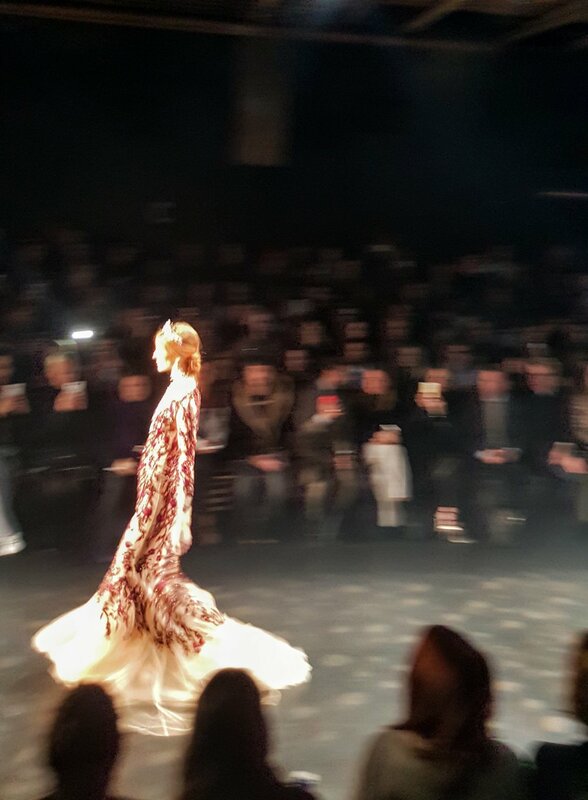 Alas, better to have seen Marchesa FW16 live than to never have been at all.